A cohort of rhesus macaques with long-standing SIVmac251 infection (≥5 mo) was treated with continuous antiretroviral therapy (ART). 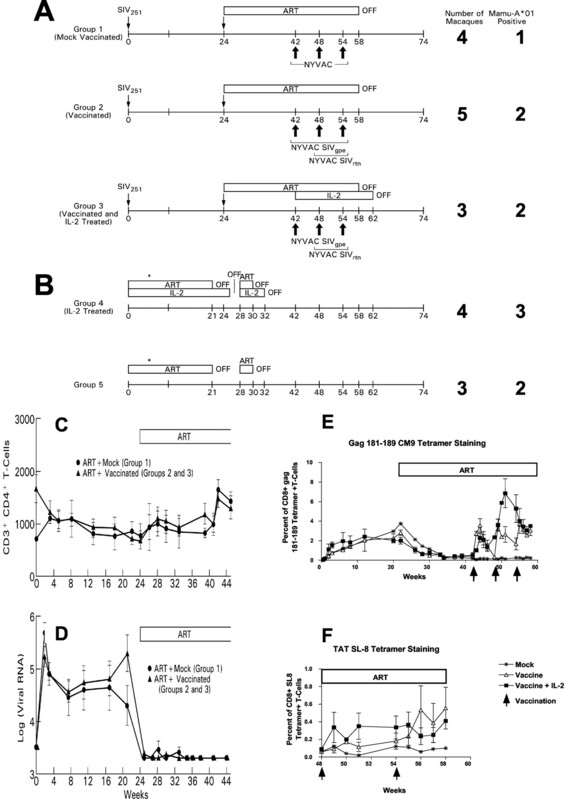 A group of eight macaques was vaccinated with or without simultaneous administration of low dose IL-2 with the highly attenuated poxvirus vector (NYVAC) vaccine candidate expressing the SIVmac structural gag-pol-env (gpe) genes and a novel chimeric fusion protein derived from the rev-tat-nef (rtn) regulatory genes. Control groups consisted of mock-vaccinated macaques or animals treated only with IL-2. Vaccination significantly expanded both virus-specific CD4+ and CD8+ T cell responses, and IL-2 further increased the vaccine-induced response to an immunodominant Gag epitope. Following antiretroviral treatment interruption, the viral set point was significantly lower in vaccinated than in control macaques for at least 4 consecutive mo, and viral containment was inversely correlated with vaccine-induced, virus-specific CD4+ and CD8+ T cell responses. These data provide the proof of concept that therapeutic vaccination before cessation of ART may be a feasible approach in the clinical management of HIV-1 infection. Antiretroviral therapy (ART)3 of HIV-1-infected individuals has dramatically decreased the morbidity and mortality of chronic HIV-1 infection (1). However, ART fails to eradicate HIV-1-infected cells (2, 3, 4, 5), and prolonged treatment is associated with significant side effects and reduction of the level of the virus-specific immune response (6, 7), presumably because of the decreased exposure to viral Ags. Treatment interruption of potent ART in most HIV-1-infected individuals is associated with an increase in virus-specific host immune response (8, 9), which is nevertheless insufficient to contain viral replication in most cases (10, 11, 12, 13). Since both CD4+ and CD8+ virus-specific T cell responses have been associated with containment of HIV replication (14, 15, 16), a logical experimental approach is to attempt to augment virus-specific responses by active vaccination before ART discontinuation (17, 18). To this end we have chosen the highly attenuated NYVAC-based recombinant vaccines SIV-gag-pol-env (SIV-gpe) and SIV-rev-tat-nef (SIV-rtn; NYVAC-SIV-gpe (19) and NYVAC-SIV-rtn (20)), because of the ability of this vaccine modality to induce/expand virus-specific CD4+ and CD8+ T cell responses in naive macaques (19, 21) as well as in SIVmac251-infected macaques (17, 52). During primary SIVmac251 infection, the possible benefit of immunization with this vaccine modality is obscured by the beneficial effect of early initiation of ART, as also observed in some HIV-1-infected individuals treated early in infection (17, 22, 23, 24, 25, 26, 27, 53, 54). Therefore, we enrolled macaques infected with SIVmac251 for 6 mo, treated them with ART, and immunized them without or with simultaneous administration of IL-2 or with mock NYVAC vaccine. In humans, administration of daily low dose (i.e., ∼2 million U/day) of IL-2 has been found to augment cell-mediated immune responses and to increase the number of circulating NK cells as well as CD4+ T cells (28). In addition, when administered before and after structured treatment interruption (STI), daily low dose IL-2 resulted in increased circulating CD8+ T cell concentrations coincident with a decline in plasma HIV concentrations to a set point (29). In parallel, other macaques infected with the same viral stocks (17, 30) that had been viremic for a minimum of 5 mo to a maximum of 15 mo were treated either with ART and IL-2 or with ART alone. Antiviral therapy cessation was used as a diagnostic tool to assess the immune control on viral replication in all macaque groups. ART consisted of i.v. administration of didanosine (10 mg/kg/day), oral administration of stavudine twice a day (1.2 mg/kg/dose), and s.c. administration of (R)-9-(2-phosphonylmethoxypropyl) adenine (20 mg/kg/day). NYVAC-SIV-gpe, NYVAC-SIV-rtn (20), or NYVAC vector was given by the i.m. route at a dose of 1 × 108 PFU/immunization to macaques that were not subjected to prior treatment except for infection with SIVmac251(561) (30) and ART treatment, as indicated in Fig. 1⇓A. Macaques in groups 3 and 4 had been infected with the same stock of SIVmac251(561) (30) for a minimum of 5 mo to a maximum of 15 mo, and their previous treatment was described previously (17, 30). IL-2 was given daily by s.c. inoculation at a dose of 120,000 IU to macaques in groups 3 and 4. The dose was decided following a pharmacokinetic study in macaques (9, 55). Study design, ART effect, and immune response to the codominant Gag181–189 CM9 and Tat SL8 epitopes following vaccination. A and B, Diagram of the study design, indicating the total number of macaques and the number of Mamu-A*01-positive macaques in each group. IL-2 treatment was terminated at the time indicated. C and D, The mean virus load (C) and CD4+ T cell counts (D) before and during ART treatment are presented for macaques in groups 1, 2, and 3, and Table I⇓ summarizes the data at the time of ART initiation for all macaques. E, Frequency of CD3+ CD8+ Gag181–189 CM9 tetramer-positive T cells in blood of Mamu-A*01-positive macaques in groups 1, 2, and 3 over time. F, Frequency of CD3+ CD8+ Tat SL8 tetramer-positive T cells after the two immunizations with NYVAC-SIV-rtn at wk 48 and 54. Eepitope-specific CD3+ CD8+ T lymphocytes were detected by tetramer staining. Fresh PBMC were stained with anti-human CD3 Ab (PerCP labeled, clone SP34; BD PharMingen, San Diego, CA), anti-human CD8α Ab (FITC labeled; BD Bioscience, San Jose, CA), and Mamu-A*01 tetrameric complexes refolded in the presence of a specific peptide and conjugated to PE-labeled streptavidin (Molecular Probes, Eugene, OR). Gag181–189 CM9 (CTPYDINQM) (Gag CM9) and Tat28–35 SL8 (TTPESANL; Tat SL8)-specific tetramers were used (18). Samples were analyzed on a FACSCalibur (BD Biosciences), and the data are presented as the percentage of tetramer-positive cells of all CD3+ CD8+ lymphocytes. The Mamu-A*01-restricted peptides Gag181–189 CM9, Gag QI9, Env TL9, and Tat SL8 (31) were used in Mamu-A*01-positive macaques. In Mamu-A*01-negative macaques, peptide pools (15 aa in size overlapped by 11 aa) encompassing the entire Gag, Env, Tat, and Rev proteins were used. One to 2 μg of each pool were used (32). The pools contained 120 peptides for Gag, 100 for Env 1, 96 for Env 2, 22 for Tat, and 20 for Rev. Information on the precise composition of each pool is available upon request. Macaque IFN-γ-specific ELISPOT kits (U-Cytech, Utrecht, The Netherlands) were used to detect the number of Ag-specific, IFN-γ-producing cells. Ninety-six-well, flat-bottom plates were coated with anti-IFN-γ mAb MD-1 overnight at 4°C and blocked with 2% BSA in PBS for 1–3 h at 37°C. Cells (1 × 105/well) were loaded in triplicate in RPMI 1640 containing 5% human serum and specific peptides or 5 μg/ml Con A as a positive control. The plates were incubated overnight at 37°C in 5% CO2 and developed according to the manufacturer’s guidelines (U-Cytech). PBMC (1 × 106) were incubated for 2 h at 37°C with 1 μg/ml of peptides in RPMI 1640 growth medium containing 5% FBS, 0.5% gentamicin, and 5% glutamine. Unstimulated or staphylococcal enterotoxin B-stimulated PBMC served as negative and positive controls, respectively. To allow for intracellular accumulation of IFN-γ, 2 μl Golgiplug (brefeldin A; BD PharMingen) was added, and the incubation was continued overnight at 37°C. PBMC were then stained for CD4+ and CD8+ T cell subsets using anti-human CD4 and CD8 mAbs conjugated to FITC (CD4-FITC, catalog no. 71024L; BD PharMingen) and PerCP (CD8-PerCP, catalog no. 347314; BD Biosciences), respectively. After 30-min incubation at 4°C, PBMC were washed in PBS, fixed, and permeabilized with 100 μl Cytofix/Perm solution (BD PharMingen), followed by staining for intracellular IFN-γ using 0.4 μg of PE-conjugated anti-human IFN-γ (BD PharMingen). Finally, PBMC were washed, resuspended in PBS containing 2% formaldehyde, and analyzed using a FACSCalibur flow cytometer and CellQuest software. By generating dot plots of forward vs side scatter, 30,000 events were acquired in the lymphocyte population from which IFN-γ-positive CD4+ and CD8+ T lymphocytes were calculated. Results were expressed as the percentage of IFN-γ-positive cells for each lymphocyte subset. Neutralizing Abs against the primary SIVmac251/561L (produced in human PBMC) were detected as described previously (19). Neutralizing Ab titers were defined as the reciprocal plasma dilution at which 50% of the target cells were protected from virus-induced killing as detected by neutral red uptake. CEMx174 cells were used as targets for SIVmac251 virus, and CEMxR5 were used as targets for SIVmac251/561L virus. Nineteen macaques infected with the SIVmac251 (561) challenge stock (30) were enrolled in the study and divided into five groups (Fig. 1⇑A). The macaques in groups 1, 2, and 3 were naive before infection with SIVmac251. Macaques in groups 4 and 5 were infected with the same viral strain as previously described (17, 30). The macaques were subjected to a daily triple drug regimen of the nucleotide analogs (R)-9-(2-phosphonylmethoxypropyl) adenine, stavudine (d4T), and didanosine for a minimum of 21 wk (Fig. 1⇑). IL-2 at low dose was chosen to promote immune restoration (33, 34) and potentiate the vaccine effect. One group of macaques was immunized with the NYVAC mock vaccine (group 1), and two groups were immunized with the NYVAC-SIV-gpe and NYVAC-SIV-rtn vaccines without (group 2) or with (group 3) coadministration of daily low dose IL-2 (120,000 IU; Fig. 1⇑A). Macaques in group 4 received IL-2 only, and those in group 5 had no additional treatment except ART (Fig. 1⇑B). In macaques from groups 4 and 5, a short interruption of ART was performed between wk 21 and 28 before suspending all treatments, as indicated in Fig. 1⇑B. At the start of ART treatment neither the absolute CD4+ T cell count per cubic millimeter nor the plasma viral RNA copy number differed significantly (by Kruskal-Wallis test, P > 0.2) among macaques enrolled in the groups to be vaccinated (groups 2 and 3) or controls (group 1; Fig. 1⇑, C and D, and Table I⇓), and plasma virus levels became undetectable (<2000 copies/100 μl) during ART in all three groups of macaques. Viral rebound in macaques in groups 4 and 5 occurred when ART was suspended between wk 21 and 28 (data not shown). Ten of the 19 macaques had the MHC class I Mamu-A*01 molecule (35, 36) (Fig. 1⇑A), thereby enabling us to measure Mamu-A*01-restricted CD8+ T cell responses to dominant and subdominant SIVmac epitopes (31) using tetramers (36, 37), ELISPOT, or intracellular cytokine staining. In the nine Mamu-A*01-negative macaques, the virus-specific CD8+ and CD4+ T cell responses were assessed by ELISPOT and intracellular cytokine staining (38) following in vitro stimulation with 15 mers overlapping 11 aa (39) encompassing the Gag, Env, Rev, Tat, and Nef proteins of SIVmac251. Proliferative responses to p27 Gag and gp120 Env were also measured in all 19 macaques. ART treatment decreased the percentage of Gag181–189 CM9 tetramer-positive cells in blood, which, at the time of the first vaccination, was at the background level in Mamu-A*01-positive macaques from groups 1, 2, and 3 (Fig. 1⇑E). The first immunization with NYVAC-SIV-gpe (wk 42) significantly increased the percentage of CD8+ T cells specific for the Gag181–189 CM9 epitope in the blood of macaques from groups 2 and 3. Following the second immunization (wk 48), a significant additive effect of IL-2 coadministration was observed in macaques from group 3 (p = 0.016; wk 49–54; Fig. 1⇑E). However, at the time of STI (10) (wk 58), the mean frequency of this response in the blood of the immunized macaques was equivalent in macaques from groups 2 and 3 (Fig. 1⇑E). The Tat SL8 response was also expanded by vaccination with NYVAC-SIV-rtn (Fig. 1⇑F); however, in this case, no significant differences were observed among macaques treated or not with IL-2. No significant changes in the frequency of the responses to Gag181–189 CM9 or Tat SL8 were observed during ART treatment of macaques in groups 4 and 5 (data not shown). At the start of immunization (wk 42), the cumulative frequency of virus-specific T cells with various antigenic specificities measured by ELISPOT varied among macaques and were increased significantly in the vaccinated macaques. Repeated measures ANOVA of the square root-transformed ELISPOT values from weekly measurements (wk 42–58) that included various specificities (Gag, Env, Tat, Rev) demonstrated significant differences among the mock-vaccinated and vaccinated macaques (p = 0.023). ELISPOT data for various specificities for each individual macaque at the time of immunization (wk 42) and at the maximum response are shown in Fig. 2⇓A. Macaques vaccinated in the presence of IL-2 did not develop significantly higher ELISPOT responses measured with Gag, Env, Tat, and Rev overlapping peptides than those vaccinated in the absence of the cytokine over the entire period of immunization (wk 42–58; Fig. 2⇓A and data not shown). Similarly, no significant differences in the kinetics or duration of ELISPOT response were observed when the vaccine was given together with IL-2 (data not shown). Virus-specific CD4+ and CD8+ T cells induced by vaccination. A, Frequency of IFN-γ-producing cells per 106 peripheral blood cells at time of immunization (wk 42) and at the maximum peak obtained are indicated on the y-axis and are presented separately for Mamu-A*01-positive macaques (top panels) and Mamu-A*01-negative macaques (bottom panels). B, Direct IFN-γ intracellular cytokine staining at the time of immunization (wk 42), 2 wk after (wk 44), and 5 wk after the second immunization. (Figure continues) Figure 2⇓. Continued. C, Proliferative response to SIV p27 Gag and gp120 over the entire immunization period. D and E, Scatter plot analysis of lymphoproliferative response to Gag and Env proteins and the CD8− (CD4+) T cell response. In a limited number of animals, the ability of CD3+ CD8+ and CD3+ CD8− T cells to produce IFN-γ was also assessed by direct intracellular IFN-γ staining following short term in vitro stimulation with peptide pools encompassing the entire SIVmac Gag and Env proteins. At the time of immunization (wk 42), both CD8+ and CD8− (CD4+) cumulative Gag- and Env-specific responses were <0.5% in all macaques except macaque 3143, which had mounted naturally the highest and broadest CD8+ T cell responses by wk 42 (Fig. 2⇑B). Both CD8+ and CD8− (CD4+) T cell responses to Gag and Env pools were significantly increased at wk 44 above the baseline in the vaccinated groups (p = 0.0096 for CD4+ T cell responses and p = 0.0005 for the CD8+ T cell responses). In the mock-vaccinated macaques neither CD4+ nor CD8+ T cell responses significantly increased at 2 wk after the first mock immunization. Similarly, measurements performed at wk 53, 5 wk after the second immunization (Fig. 2⇑B), confirmed that vaccinated animals had increased Gag- and Env-specific CD8+ T cell responses (p = 0.0021). Interestingly, a marginal improvement in the ability of CD8+ T cells to produce IFN-γ was also observed in the mock-vaccinated macaques (p = 0.032), suggesting that ART treatment may improve this virus-specific functional response. Because in both macaques and humans treated with ART some reconstitution of the virus-specific proliferative response to Gag has been observed (15, 17, 26), we assessed whether IL-2 and/or vaccination could further expand this response (Fig. 2⇑C). Following immunizations, proliferative responses to both Gag and Env were significantly increased in the vaccinated macaques from group 2 compared with those in mock-vaccinated macaques in group 1 (p27 Gag, p < 0.0001; gp120 Env, p = 0.0002; by repeated measures ANOVA) during the interval of wk 43–57. Surprisingly, however, in macaques vaccinated in the presence of IL-2, virus-specific proliferative responses were significantly lower than those in macaques from group 2 (p27 Gag, p = 0.0039; gp120 Env, p = 0.015; by repeated measures ANOVA) within the same interval. In fact, no significant difference in the Gag proliferative response was observed in mock-vaccinated (group 1) and vaccinated macaques (group 3) treated with IL-2, and only a marginally significant difference was observed in the gp120 proliferative response (p = 0.039) between these two groups. Low proliferative responses were measured in macaques in groups 4 and 5 (data not shown). These findings raised the possibility that in IL-2-treated macaques, Gag- or Env-specific proliferative responses might not necessarily go hand in hand with the ability of Gag- or Env-specific CD4+ Th cells to produce IFN-γ. In fact, for example, although the frequency of Gag- and Env-specific CD4+ T cells producing IFN-γ was increased by vaccination in IL-2-treated macaque 3069 (see data at wk 44 in Fig. 2⇑B), at the same time points the proliferative response to Gag was quite low (stimulation index = 5.5 for p27 Gag and at background level for Env). A scatter plot of lymphoproliferative responses for Gag and Env vs IFN-γ production by CD8− (CD4+) T cells suggested a direct correlation between these responses (Fig. 2⇑, D and E). The Spearman rank correlation coefficient was 0.60 (p = 0.21) for p27 and 0.67 (p = 0.15) for gp120, but this direct correlation did not reach statistical significance, in part because of the very small number of animals tested. This apparent discordance needs to be further confirmed in studies with a larger number of macaques. Discordance between the proliferative response and the ability of virus-specific CD4+ Th cells to produce cytokine has also been observed in HIV-1-infected individuals (38). ART was suspended in the macaques at the time indicated in Fig. 1⇑, A and B. Plasma virus rebounded in all macaques, and the overall extent of plasma virus during the first 2 wk of STI did not differ significantly in macaques from all groups (Fig. 3⇓, A and B). However, the viral set point (wk 4–11) was significantly lower (p = 0.024, by Wilcoxon rank-sum test) in the vaccinated macaques (groups 2 and 3) than in control macaques (Fig. 3⇓, A and C) and remained significant up to wk 16 (p = 0.042). The comparisons of set point viremia among groups 1, 2, and 5 and between groups 3 and 5 did not reach statistical significance because of the small numbers of macaques. However, when these two comparisons were combined in a stratified test of the vaccine’s effect, with IL-2 as the stratification factor, the difference was again significant at the p = 0.027 level. A clear additive effect of IL-2 with vaccination, although suggested by the low viremia in these macaques, could not be properly evaluated because one of the three macaques (3056 in group 2) died due to drug-related toxicity at 3 wk after STI, and the number of animals became insufficient for that statistical evaluation of the data. Plasma virus level following ART suspension. Viral RNA copies per 100 μl of plasma in vaccinated macaques and control macaques (A and B) following STI were measured by nucleic acid sequence-based amplification as described previously (51 ). C, Mean plasma virus levels after STI in mock-vaccinated (group 1) and vaccinated (groups 2 and 3) macaques. Viremia among the control macaques from groups 1, 4 (ART plus IL-2), and 5 (ART only) did not differ significantly at any time point (Fig. 3⇑, A and B), indicating that treatment with IL-2 and ART alone did not provide a virological benefit. To further increase the strength of the statistical analysis, virus levels after STI in all 11 control macaques (groups 1, 4, and 5) were compared with those in the eight vaccinated macaques (groups 2 and 3). A significantly lower viremia in the vaccinated macaques was again observed (p = 0.026), further confirming that vaccination before STI, but not ART or IL-2 treatment alone, is associated with a decrease in viral set point within the first weeks of STI. While these data provide the first proof that therapeutic immunization may ameliorate the virological outcome, the effect of vaccination was not durable, and by 9 mo after STI the virus plasma levels were equivalent in control and vaccinated macaques (data not shown). As demonstrated above, viremia was contained significantly better in vaccinated macaques within the first 4 mo of STI. Since the significance of median log viremia over eight time points (wk 4–11) was 0.024, and the p value between wk 8–15 varied between 0.012 and 0.042, we chose the median virus load at wk 4–11 as representative of a set point value from the middle of the range to perform correlative analysis with immune response preceding and following STI. The analysis of ELISPOT data measured weekly in all macaques after immunization (wk 42–58) included responses specific for the entire Gag, Env, Tat, and Rev proteins in Mamu-A*01-negative macaques. In the case of the Mamu-A*01-positive macaques, the analysis included ELISPOT responses to the Gag181–189 CM9, QI9, Env TL9, and Tat SL8 epitopes (31). A significant inverse correlation (p = 0.04) was found between the median of all measured SIV-specific CD4+ and CD8+ T cell responses (wk 42–58) measured by ELISPOT induced by vaccination and plasma virus levels at the set point during ART suspension (Fig. 4⇓A). Immune correlates of viremia containment. A, The median ELISPOT responses from wk 42–58 with the antigenic specificities indicated in Fig. 2⇑A observed in each animal have been related to the plasma virus level during wk 4–11. B and C, Correlation of peak proliferative responses to p27 Gag or gp120 (wk 44; see also Fig. 2⇑C), respectively, to set point viremia during STI (wk 4–11). Similarly, a negative correlation coefficient (−1. 0) was found when the peak Gag181–189 CM9 tetramer responses (wk 51) were correlated with viremia during the same 4–11 wk post-STI interval, but because of the small number of Mamu-A*01-positive macaques (total of five), statistical significance was only approached (p = 0.083; data not shown). Interestingly, a negative correlation was also found with the changes from wk 42 to wk 44 in the Gag intracellular cytokine staining of CD8+ T cells with a Spearman rank correlation coefficient of −0.97 (p = 0.022; data not shown). Proliferative responses to p27 Gag or gp120 elicited by vaccination were highest following the first immunization and were not boosted significantly by the second and third immunizations (Fig. 2⇑C). Analysis of peak proliferation values at wk 44 for each macaque and median virus load at set point during STI revealed negative Spearman rank correlation coefficients of −0.61 and −0.59 for p27 Gag and gp120, respectively. However, although the coefficients were noteworthy in size, the p values were only close to the standard threshold for statistical significance (p = 0.048 and p = 0.057, respectively; Fig. 4⇑, B and C). Next we measured neutralizing Ab titers against the primary viral challenge, SIVmac251(561) (30) before ART initiation and during viral rebound and assessed whether they correlated positively or negatively with viremia containment at the set point. Serum neutralizing Ab titers to the primary viral stock challenge before ART initiation and at 1–2, 3, 9, or 11–13 wk after therapy suspension are summarized in Table II⇓. Overall, viral rebound elicited the highest titers of neutralizing Abs in the vaccinated macaques of group 1. Analysis of the correlation between set point viremia and neutralizing Ab titers at 4 times after ART suspension and set point resulted in negative correlation coefficients of −0.32 (p = 0.34), −0.52 (p = 0.098), −0.19 (p = 0.58), and −0.33 (p = 0.32) from the earliest to the latest points measured (Table II⇓). However, a positive trend was apparent between the pre-ART titers and set point viremia (correlation coefficient = 0.53; p = 0.068). Thus, Ab titers to the primary SIVmac251(561) (30) challenge stock that pre-existed and/or were expanded within the first 4 wk of STI may have contributed to viremia containment during STI. A similar association was described in a few HIV-1-infected individuals (18). Together these data obtained in macaques with long-standing SIVmac251 infection, a model that well mimics human AIDS, provide proof that vaccination during ART may result in a decrease in the viral set point following ART withdrawal. This idea is supported by the finding here that several of the measured virus-specific immune responses increased by vaccination inversely correlated with the containment of viremia at set point. Interestingly, both virus-specific CD4+ and CD8+ T cell responses inversely correlated with viremia containment even in a study with a relatively low number of subjects, as also observed in a prophylactic vaccine study in macaques in which NYVAC-SIV-gpe was used in combination with DNA (21, 56). The frequency of Gag-specific CD8+ immune T cells, whether measured with a specific tetramer or by a functional readout such as intracellular cytokine staining assay (IFN-γ production), inversely correlated with viremia containment. Both the Gag-specific proliferative responses and the intracellular cytokine staining of CD8− (CD4+) T cells expanded by vaccination correlated negatively with set point viremia after STI and directly with each other. As expected, the overall response measured by ELISPOT using specific peptides recognized by Mamu-A*01-positive macaques (31) or overlapping tetramers (11 aa overall) encompassing the entire Gag, Env, Tat, and Rev proteins also inversely correlated with set point viremia during STI. A negative correlation, although not significant, was also found between neutralizing Ab titers to the primary SIVmac251(561) (30) viral challenge stock, which is as difficult to neutralize as other SIVmac isolates (our unpublished observations), also suggesting that neutralizing Ab may have contributed to viremia containment. Thus, possibly all adaptive immune responses might have contributed to the transient reduction of viremia observed in the vaccinated macaques. Importantly, vaccination did not worsen the virological outcome. Since HIV-1-specific CD4+ T cells appear to be preferentially infected by the virus (40), vaccination by inducing a significant expansion of virus-specific CD4+ T cells in the macaques studied here could have resulted in higher viremia after STI. The facts that a reduction of viremia was indeed observed in our study and that it inversely correlated with virus-specific CD4+ T cell responses suggest that the magnitude and functionality of this response induced by vaccination were sufficient to improve, at least transiently, the function of CD8+ T cells, which is known to be impaired in SIVmac as well as HIV-1 infection (41, 42, 43, 44, 45), and might have resulted in a decreased spread of the virus to CD4+ T cells. Indeed, CD4+ T cells are essential in maintaining a functional immune response (46), and in the SIVmac model adaptive transfer of naive CD4+ T cells has provided virological benefit (47). The transient nature of immune control observed in our study also suggests that more potent vaccine strategies or a combination of vaccine modalities is probably needed to obtain protracted virological benefit. To this end, here we have also attempted to modulate the response to vaccination using a low dose of IL-2. Collectively, our results demonstrate that the immune response elicited by this vaccine modality was modulated by the simultaneous administration of a continuous low dose of IL-2. The addition of IL-2 to NYVAC-SIV-based vaccines was associated with a significant increase in the frequency of tetramer-staining CD3+ CD8+ T cells to the dominant Gag181–189 CM9 response in the blood of macaques at the peak of the immune response following the second immunization. However, at the end of the immunization regimen, no difference in the frequency of CD8+ memory cells with this specificity was observed in macaques vaccinated in the presence of IL-2 (Fig. 1⇑E). A higher number of IFN-γ-producing cells in the ELISPOT following the Gag181–189 CM9-specific peptide stimulation was also observed during the same period, suggesting that IL-2 modulated the expansion/survival of this vaccine-induced functional response to a dominant Gag epitope. Analysis of the frequency of ELISPOT responses with other specificities, such as to the entire Gag, Env, Tat, and Rev proteins, in the vaccinated macaques, however, did not demonstrate significant differences in the extent or duration of this response in macaques also treated with IL-2. Similarly, measurement of intracellular production of IFN-γ in CD4+ or CD8+ T cells following in vitro stimulation with a peptide pool encompassing the entire Gag and Env proteins did not reveal differences in macaques vaccinated in the presence of low dose IL-2. However, we believe that these questions need to be addressed in a larger number of macaques before reaching any definitive conclusion. Surprisingly, however, significant differences were observed in the extent of the proliferative response to both p27 Gag and gp120 (Fig. 2⇑C). Although the underlying mechanism of this phenomenon is at present unclear, it is possible that IL-2 treatment, by increasing the activation and the turnover of Ag-specific cells in vivo (48, 49), may result in a decreased ability of these cells to further proliferate in vitro. Alternatively, IL-2 may induce cell death in vivo (50) and truly decrease the frequency of these CD4+ Ag-specific T cells. We believe that the latter interpretation is unlikely, since at the end of the immunization regimen the proliferative responses in the vaccinated groups were equivalent (Fig. 2⇑C). Nevertheless, because direct quantification of CD4+ T cell responses to Gag and Env, using the intracellular cytokine staining method, in parallel with lymphoproliferative responses was not performed in a sufficient number of macaques, further studies are needed to clarify this point (Fig. 2⇑D). Even though in this study we were unable to demonstrate by statistical methods that the addition of IL-2 to the vaccine improved the virological outcome after STI (because of the drug-related death of one macaque), macaques treated with the combination of IL-2 and vaccine appeared to contain viremia effectively during STI, suggesting that the addition of IL-2 did not worsen the virological outcome. Thus, the relative efficacy of low dose IL-2 as a vaccine adjuvant needs to be further evaluated in a larger study. To this end, the use of intermittent dosing vs continuous administration of this cytokine as well as other cytokines that may increase the frequency and function of Ag-specific cells in combination with vaccination also needs to be carefully evaluated. In summary, we believe that active vaccination may be of benefit to ART-treated individuals with long-standing HIV-1 infection, and we hope that the data presented here will be instrumental in moving various vaccine modalities, alone or in combination with cytokines, to clinical testing in humans. We thank John D. Altman for the tetramers; Norbert Bischofberger for the generous gift of (R)-9-(2-phosphonylmethoxypropyl) adenine; Jim Miller, Sherry Rippeon, Ginger Donnelly, Virginia Livingston, Sonny Crabbs, and Dr. Wendy Wagner for animal care and treatment; J. Scott Cairns for support; and Steven Snodgrass for editorial assistance. ↵1 This work was supported by Contract N01-AI-15451 (to M.G.L.). Part of the work was supported by National Institutes of Health Grant AI85343 (to D.C.M.). ↵3 Abbreviations used in this paper: ART, antiretroviral therapy; gpe, gag-pol-env; rtn, rev-tat-nef; STI, structured treatment interruption. 4 G. Franchini. 2002. Modeling immune intervention strategies for HIV-1 infection of humans in the macaque model. Submitted for publication. 5 M. Markowitz, X. Jin, A. Hurley, V. Simon, B. Ramratnam, M. Louie, G. R. Deschenes, M. Ramanathan, Jr., S. Barsoum, J. VanderHoeven, et al. 2002. Discontinuation of antiretroviral therapy commenced early in the course of HIV-1 infection with or without adjunctive vaccination. Submitted for publication. Kovacs, J., R. A. Lempicki, I. A. Sidorov, J. W. Adelsberger, G. Kelly, J. A. Metcalf, R. T. Davey, J. Falloon, M. A. Polis, J. Tavel, et al. 2002. Prolonged and preferential survival of CD4+ T lymphocytes in HIV-infected patients receiving IL-2 therapy. In 9th Conference on Retroviruses and Opportunistic Infections. Seattle, p. 25 (Abstr. 103). Hel, Z., J. Nacsa, W. P. Tsai, A. Thornton, L. Giuliani, J. Tartaglia, and G. Franchini. Equivalent immunogenicity of the highly attenuatedpoxvirus-based ALVAC-SIV and NYVAC-SIV vaccine candidates in SIVmac251-infected macaques. Virology. In press. Franchini, G. Modeling immune intervention strategies for HIV-1 infection of humans in the macaque model. Clin. Appl. Immunol. Rev. In press. Nacsa, J., J. Stanton, K. J. Kunstman, D. I. Watkins, S. M. Wolinsky, and G. Franchini. Emergence of cytotoxic T lymphocyte escape mutants following antiretroviral treatment suspension in rhesus macaques infectedwith SIVmac251. Virology. In press. Hel, Z., J. Nacsa, E. Tryniszewska, W. P. Tsai, R. Washington Parks, D. C. Montefiori, B. K. Felber, J. Tartaglia, G. N. Pavlakis, and G. Franchini. Containment of SIV infection in vaccinatedmacaques: correlation with the magnitude of virus specific pre- and postchallenge CD4+ and CD8+ T cell responses. J. Immunol. In press.